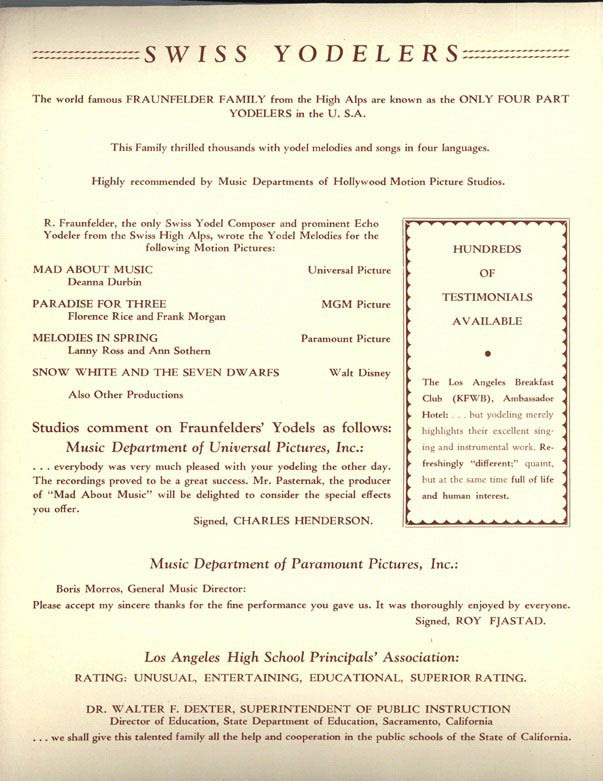 "Popcorn, Fraunfelders and a Movie"
The early Fraunfelder performances were often accompanied by motion pictures (with sound) such as the 1932 full length comedy Swiss ski film, "Slalom," or a Sonja Henie ice skating short, "Swiss on White," or another short called, "Swiss Ski School." There were also films promoting the American Red Cross. The poster below is for an an appearance at Benson Polytechnic High School Auditorium in Portland, Ore. Slalom, which was produced in black and white on seven reels and not released in the U.S. until 1936, was billed as the first feature-length ski film. It was 87 minutes long. 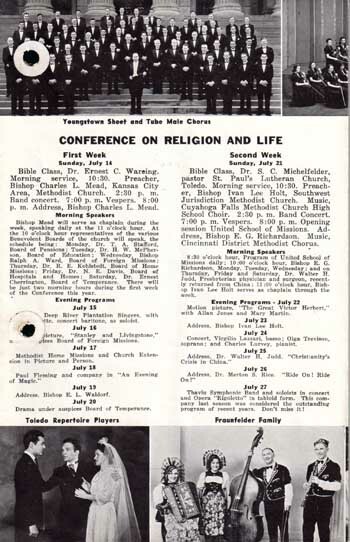 The year of the handbill below is not identified but believed to be around 1938, when the Fraunfelders had a similar Slalom movie billing at historic Trinity Auditorium in Los Angeles, California (below.) The Trinity venue seated 1,600 to 2,500 people with three balconies and a stained-glass ceiling. No information on whether popcorn was available. 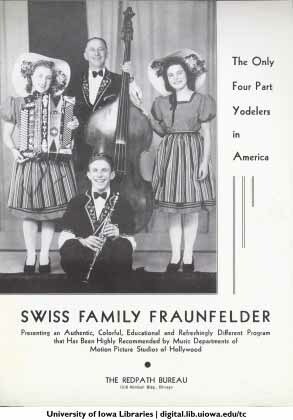 Part of Swiss Family Fraunfelder history such as these posters above are preserved through the U.S. Library of Congress and the University of Iowa because of the yodelers' particpation in the traveling educational shows across the country known as the "Chautauqua Circuit." The poster on the top left was prepared by the show promoter, "The Redpath Bureau," one of more than 20 companies operating circuits. 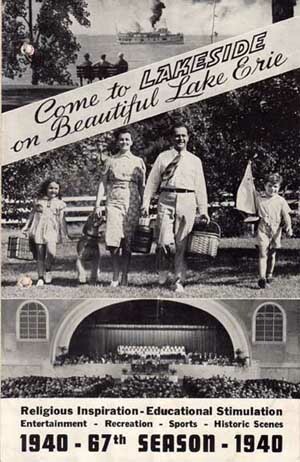 We know that the Fraunfelders performed for Chautauqua organizations in Midwest states like Lakeside Chautauqua in Ohio (below), where they were the opening act of an eight-week program schedule in 1942. More than 3,000 Swiss and their descendants are still active today in Swiss organizations in the Tacoma/Bonney Lake/Pierce County area of Washington state, according to Louise Albert Mueller Hospenthal, president of the Fife Historical Society The Fraunfelders likely performed here multiple times throughout their career as there was a large concentration of Swiss immigrants. 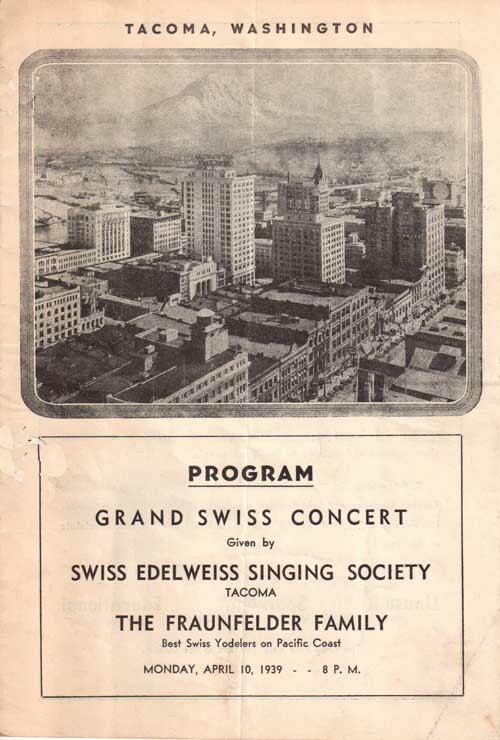 The "Grand Swiss Concert," where the Fraunfelders performed in Tacoma in 1939, is still held every three years at rotating locations on the West Coast. The Swiss hall where they performed is now on the campus of the University of Washington-Tacoma and is called "The Swiss Restaurant and Pub." The upstairs meeting hall still features a large wall mural of the Alps. 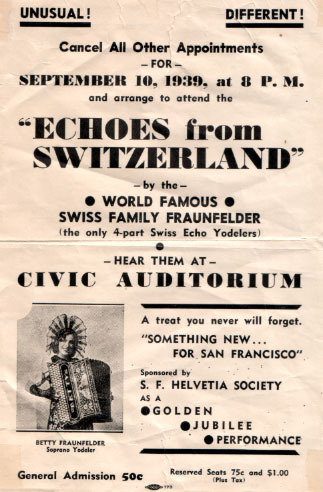 >>> Click HERE for more handbills and information on the Fraunfelders in Tacoma and at Swiss events and clubs up and down the West Coast in 1939 and 1940. 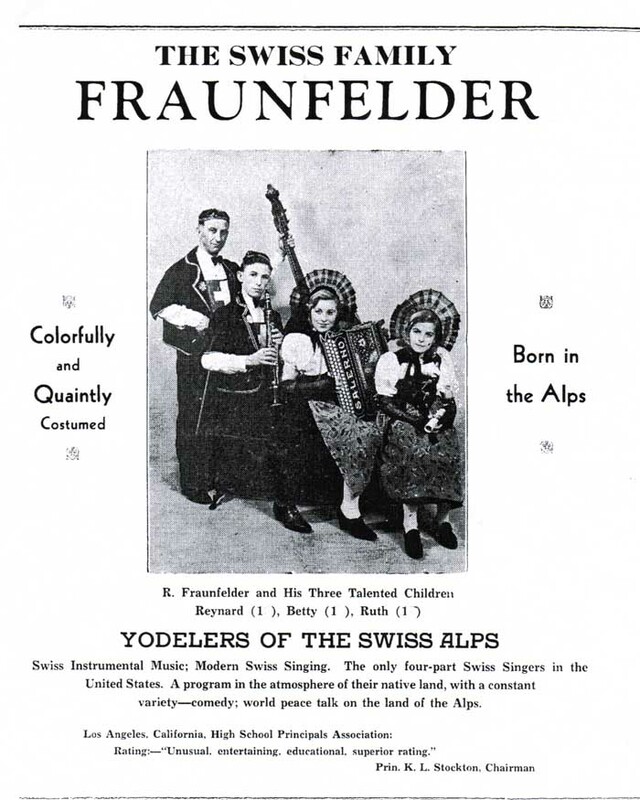 These posters in the early years were used before the act was known as "Swiss Family Fraunfelder ." 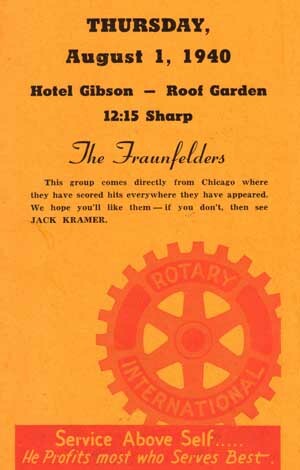 Note the references to minor roles that the Fraunfelders apparently played in motion pictures. 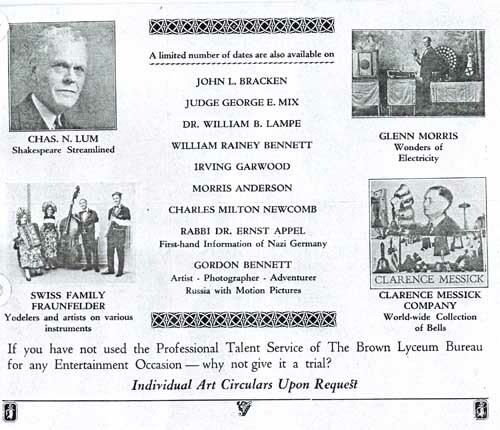 These early performances were at places like schools and civic clubs. 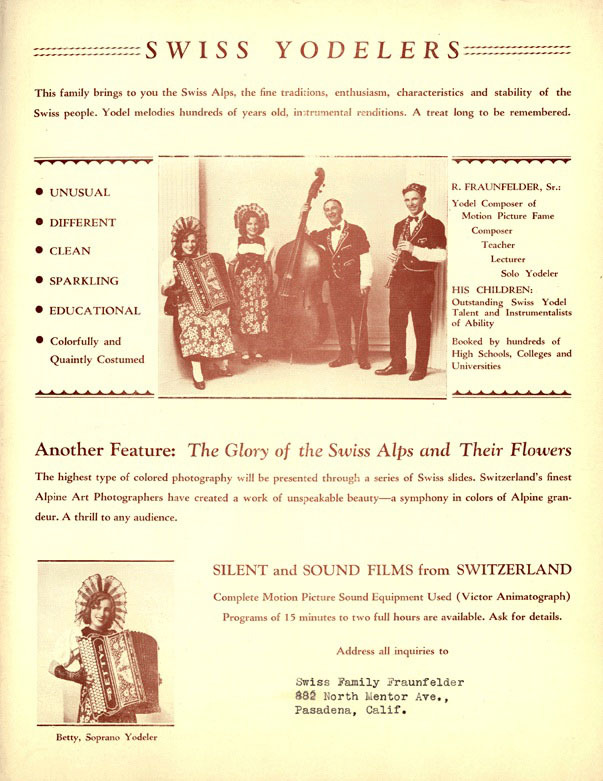 Frequently, the performances were accompanied by slides or films of Switzerland, often narrated by Papa Fraunfelder. 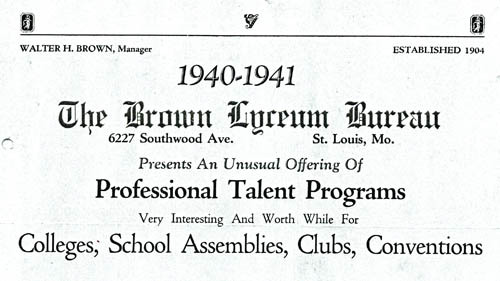 Excerpts from the cover of the 1940-41 Brown Lyceum Talent Brochure, St. Louis, Mo. The Swiss Family Fraunfelder is listed in the lower left hand corner of the broadsheet cover page. 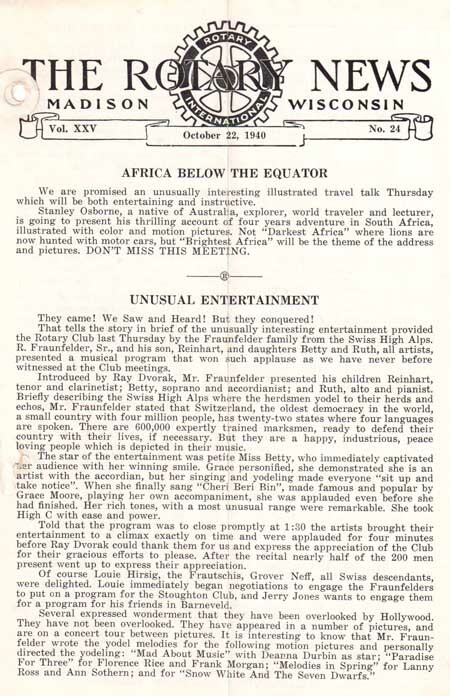 This likely was one of the many spinoffs of the Chautauqua movement. Betty sings "Cherry Berry Bin (Ciriciribin, Grace Moore hit)"
Ruth (Fraunfelder) Buckley was now married and living in Wisconsin. 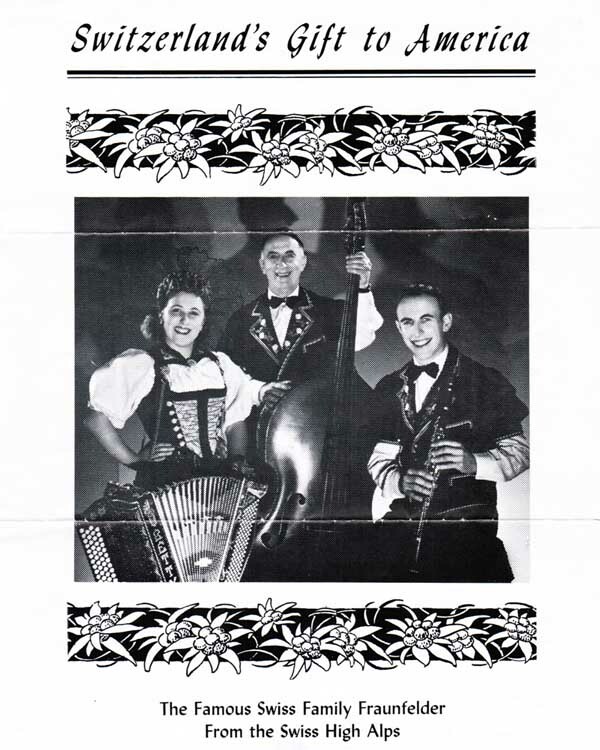 This flyer, probably used in the early 1950s, when the trio was living in Hood River, Ore. It featured only Betty, Papa and Rheiny. 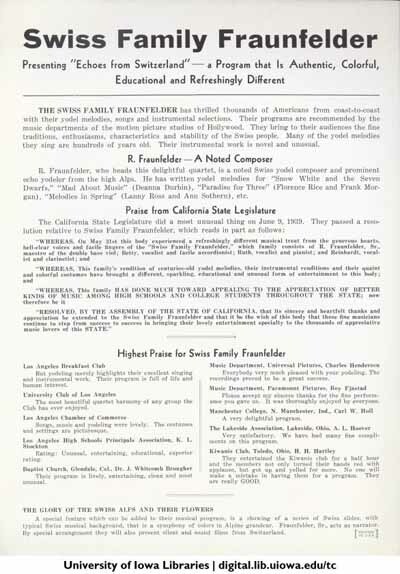 It still carries some of the same endorsements garnered by the full quartet in the 1930s and 1940s.